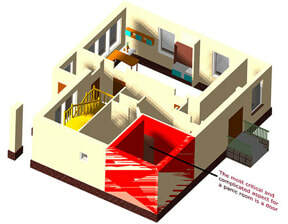 A Safe room can be designed within your house. Typically, you would chose a room, often the master bedroom and we would install a door that would look like a normal door but would take someone with an axe at least 10 minutes to get through. This combined with a landline can give the extra time needed to get help. We can protect the room even further by replacing your windows with a ballistic version. ​We are a leading supplier of Security Doors and Windows providing a full range of commercial products in timber and steel that can provide protection against vehicle-delivered charges, hand-delivered charges and fragmentation, as well as handguns, rifles and larger weapons. Door sets are blast tested on both inward and outward opening configurations. Single and double door sets, vision panels, single-point and multiple locking systems are all configured within testing. Door sets are also ballistic tested in ISO-accredited test houses, and equipment is calibrated and ammunition loaded by hand to ensure consistent testing and reliability.